We've helped a whole lot of great people since we opened our first chiropractic clinic in Singapore five years ago. People like Life Chiropractic Centre... a lot. 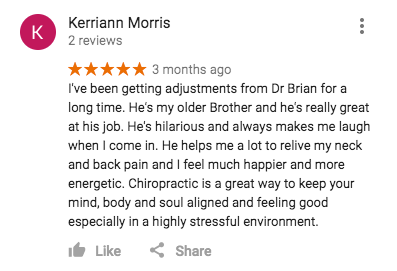 Check out some of the reviews, below. “ I have a lot more energy and have more focus at what I do.” – Sam L.
“Chiropractic Care has decreased my back pain and I can sleep with a good posture!” – L. I.S. One of Life Chiropractic Clinic's young patients, Olyver, talks about the positive effects of his adjustments. He came to us because he wasn't able to attend school due to a serious amount of bodily pain and immobility problems. Within three months, he was able to attend school regularly - which his mum couldn't believe was even possible. It was also brilliant news, because he's insanely clever and an absolute dude. Joo Chiat Location: 307 Joo Chiat Road, Singapore 427558. Call or SMS 9176 8065! CBD Location: 10 Anson Road, International Plaza #03-26, Singapore 079903. Call or SMS 9176 8065! Drop in for a chat or send us a nifty text for more info!